Today I’m over the moon to be on The Murder Of Harriet Monckton by Elizabeth Haynes blog tour. From the award-winning and bestselling author of Into the Darkest Corner comes a delicious Victorian crime novel based on a true story that shocked and fascinated the nation. Before I share my review here’s the book description to pique your interest…..
On 7th November 1843, Harriet Monckton, 23 years old and a woman of respectable parentage and religious habits, is found murdered in the privy behind the chapel she regularly attended in Bromley, Kent. The community is appalled by her death, apparently as a result of swallowing a fatal dose of prussic acid, and even more so when the surgeon reports that Harriet was around six months pregnant. I’m convinced I have just read a book that’s definitely going to be on my list of “top reads of 2018”of the year. I’m a huge fan of Elizabeth Haynes writing and I love a good crime thriller, but until now I’ve always shied away from historical crime fiction I much prefer to read books written in the “here and now”. I’m thrilled that I decided to put my concerns to one side and pick up The Murder Of Harriet Monckton, what a fabulous book it turned out to be. I will never forget Harriet Monckton’s story as it’s based on fact. This novel is not only fascinating and beautifully written, it’s also one of the most compelling books I’ve read EVER. Harriet was murdered in 1843 in Bromley, England. Elizabeth Haynes stumbled across some documents whilst researching another novel and this is Harriet’s enthralling story. I must applaud Elizabeth Haynes on her meticulous research into Harriet Monckton and Bromley as it was in 1843, as the reader you not only get a sense of time and place, but the claustrophobic feel of a town that has its fair share of narrow minded bigots. Drawing on coroner’s reports and witness testimonies, the novel unfolds from the viewpoints of each of the main characters. The Murder Of Harriett Monckton has a rich array of characters, that all draw suspicion, you have Harriet’s fellow teacher and companion, her would-be fiancé, her seducer, her former lover, each one appears to have a very good reason for wanting her dead. Many are seen as upstanding pillars of the community but each and everyone comes under close scrutiny, vividly described by the author each character is brought to life. I found this novel fascinating especially the coroners investigation into Harriet’s death, everything about the investigation felt primitive but incredibly authentic. Harriet’s story made for an emotive read, here was a young girl naive in many ways who just happened to be led by her heart and the events that followed shaped her short and tragic life. Once I reached the afterword by the author I find myself becoming very emotional (ok I cried ugly tears), I had become so invested in Harriet’s story like Elizabeth Haynes I too wanted justice for her. To this day Harriet’s murder might remain unsolved, but the author’s gives a satisfying and entirely plausible explanation to her death. Without a shadow of a doubt The Murder Of Harriet Monckton is a must read, the writing is sublime, the characters are wonderfully depicted, I’m sure Harriet’s story is one that will stay with me for a long time, it’s haunting and moving, and I would like to think Harriet is pleased her story has been told with such passion. In case you haven’t guessed I simply loved this book and I really can not recommend this novel highly enough. This is going to come as no surprise but I’m giving The Murder Of Harriet Monckton the very prestigious Gold Star Award Rating. It’s given to a book I feel is particularly outstanding, a book that covers every aspect of what I look for in a read, an original plot, great characters and a storyline that draws me in from the first page and keeps me in its grips until I reached the very last page. Elizabeth Haynes worked for many years as a police analyst. Her debut novel, Into the Darkest Corner, won Amazon’s Book of the Year in 2011 and Amazon’s Rising Star Award for debut novels. Elizabeth grew up in Sussex and studied English, German and Art History at Leicester University. She is currently taking a career break having worked for the past seven years as a police intelligence analyst. Elizabeth now lives in Kent with her husband and son, and writes in coffee shops and a shed-office which takes up most of the garden. She is a regular participant in, and a Municipal Liaison for, National Novel Writing Month – an annual challenge to write 50,000 words in the month of November. If my review hasn’t convinced you to buy the book, you may want to read my fellow book bloggers fabulous reviews…. This entry was posted in Book blog, Elizabeth Haynes and tagged Crime, Gold Star Award, Historical Crime Fiction, Historical Fiction, Must reads 2018, Mystery, Suspense, True Crime on October 4, 2018 by lollyrugs. Today I feel very privileged to be opening the blog tour for Never Alone by Elizabeth Haynes. I’m a huge fan of this authors books so when I was I was asked if I would like to be part of the blog tour I jumped at the chance. If you are a fan of psychological thrillers then you are going to love this book, I certainly did as you will see from my review below. Never Alone is published on the 6th October 2016, so you won’t have to wait long to get a copy. Sarah Carpenter lives in an isolated farmhouse in North Yorkshire and for the first time, after the death of her husband some years ago and her children, Louis and Kitty, leaving for university, shes living alone. But she doesn’t consider herself lonely. She has two dogs, a wide network of friends and the support of her best friend, Sophie. When an old acquaintance, Aiden Beck, needs somewhere to stay for a while, Sarah s cottage seems ideal; and renewing her relationship with Aiden gives her a reason to smile again. It s supposed to be temporary, but not everyone is comfortable with the arrangement: her children are wary of his motives, and Will Brewer, an old friend of her son s, seems to have taken it upon himself to check up on Sarah at every opportunity. Even Sophie has grown remote and distant. After Sophie disappears, it s clear she hasn’t been entirely honest with anyone, including Will, who seems more concerned for Sarah s safety than anyone else. As the weather closes in, events take a dramatic turn and Kitty too goes missing. Suddenly Sarah finds herself in terrible danger, unsure of who she can still trust. Like many readers I have been a big fan of Elizabeth Haynes since she wrote Into The Darkest Corner way back in 2011, so I had high hopes for Never Alone the book description alone piqued my interest and I must say its everything I hoped for and more. It’s well executed, gripping and definitely one of the better psychological thrillers out there at the moment. The author explores human relationships and all the ugly qualities that can come with them lies,obsession,betrayal and rejection, she manages to weave an intricate tale that grabs you by the throat and doesn’t let go to the last heart stopping chapter. The chapters alternate between Sarah Carpenter a widower living in an isolated farmhouse, with only her dogs for company, and Aiden an old acquaintance of Sarah’s who becomes her tenant. There are also chapters delivered by an unknown voice which add a chilling tone to the plot. If I’m honest to begin with I just couldn’t work out where the plot was heading, there were so many lies and secrets hidden within the characters, but like any good author Elizabeth Hayes reveals all layer by layer, and provides the reader with an intricate tale that kept me reading late into the night (a cliche I know, but true). The author does have an extraordinary way of creating ordinary characters who most readers will be able to relate to one way or another, the best friend who has secrets she’s reluctant to share, the lodger who prefers to keep his life private I could go on and on but you get the gist. I should mention there are some sexually charged scenes but they are very much in keeping with the plot and aren’t overly graphic. From the very first chapter there is a sense of foreboding and the author builds on it making this a hard book to put down. Set in a remote village on the Yorkshire Moors makes the perfect setting for this book, the author describes the setting so perfectly I had chills running down my spine at the thought of being in such a bleak and isolated place, which certainly added to my sense of uneasiness. As the plot progresses there are plenty of heart pounding moments to keep the most hardened reader glued to the edge of their seat, Never Alone is well paced, atmospheric and full of menace, this is one book psychological thriller lovers will not want to miss. Elizabeth Haynes grew up in Sussex and studied English, German and Art History at Leicester University. She is currently taking a career break having worked for the past seven years as a police intelligence analyst. Elizabeth now lives in Kent with her husband and son, and writes in coffee shops and a shed-office which takes up most of the garden. Haynes’s first novel, Into the Darkest Corner, was Amazon’s Best Book of the Year 2011 and is now a New York Times bestseller. Now published in 37 countries, it was originally written as part of National Novel Writing Month (NaNoWriMo), an online challenge to write a 50,000 word novel in the month of November. Her second novel, Revenge of the Tide, was published by Myriad in 2012 and her third, Human Remains, was published in 2013. 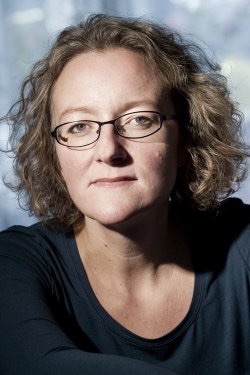 Under a Silent Moon, the first in Haynes’s Detective Inspector Louisa Smith series (Little, Brown), was published in 2014 and the second in the series, Behind Closed Doors, in 2015. This entry was posted in Book blog, Elizabeth Haynes and tagged Book Blog Tours, Book review, Crime, Crime Thriller, Mystery, Suspense, Thriller on October 3, 2016 by lollyrugs. This week sees the publication of BEHIND CLOSED DOORS from Elizabeth Haynes,the bestselling author of Into the Darkest Corner.To mark publication of the paperback on 28th January, I was asked if I would like to take part in a mini blog tour for Elizabeth. I jumped at the chance as I really enjoyed Behind Closed Doors and reviewed it back last year on my blog. 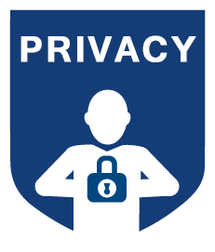 I’ve included the original review in this post if you haven’t read this book yet, then I hope the following extract from Behind Closed Doors will convince you to read it. Ten years ago, fourteen-year-old Scarlett Rainsford vanished without a trace during a family holiday to Greece. When Scarlett is discovered back in her home town after all this time, DCI Louisa Smith is determined to find out what happened to her and why she remained hidden for so long. Was she abducted or did she run away? As Lou and her team delve deeper into Scarlett’s past, their investigation throws up more questions than it answers. But as they edge closer to discovering what really went on behind closed doors, the truth is more sinister and disturbing than they had ever imagined. To begin with, nothing was certain except her own terror. Darkness, and stifling heat, so hot that breathing felt like effort, sweat pouring off her so her skin itself became liquid and she thought she would simply melt into a hot puddle of nothing. She tried crying out, screaming, but she could barely hear her own voice above the roar of the engine, the sound of the wheels moving at speed on tarmac. All that did was give her a sore throat. Nobody could hear her. She tried listening instead, eyes wide with nothing to see. She could hear voices sporadically from somewhere else in the vehicle – two different men – but she didn’t recognise them, nor could she understand what they were saying. She assumed they were speaking in Greek, but the harsh rasp of the words sounded different from the voices she’d heard over the past week at the resort. Lots of ‘th’ sounds, rolled ‘r’s, words ending in ‘a’ and ‘eh’. Fear came in cycles. The first endless panicky minutes had been very bad: trawling through vague memories of the past few days, trying to identify the mistake she’d made, because this had to be her fault – this can’t be real, I’m dreaming – then the shock realisation that this wasn’t a nightmare, it was really happening. The worst moment of all. It had been so quick. She had arrived a bit early at the place where they’d agreed to meet, and she’d been preparing to wait – he’d said he finished work at two – and a van had pulled up beside her. She hadn’t been worried. There were still people around, drunk tourists staggering back up the road towards their hotels. The side door of the van had slid open, and a man got out. He was talking to her, friendly, a smile that showed his teeth. His accent was so strong she couldn’t really tell what he was saying. But he’d kept yammering on, standing too close to her. She had begun to feel unnerved by it, and something had made her glance to the right, to the gate which led to the Aktira Studios, and in that split second when she’d seen someone she recognised, made eye contact, she had felt something like relief – and then the man had pushed her, a hard shove that sent her sprawling into the back of the van. He’d climbed in after her, slammed the door shut and the van started moving. The man had held her down, put his hand over her mouth, pressing her head into the metal floor so hard that she’d thought her skull was going to burst. Seconds. The whole thing had taken seconds. Now, hours since those terrifying first moments, she had reached a plateau brought on by the monotony of driving, the panic overridden by the pain in her arms and legs and the discomfort of being tied hand and foot and having to lie still on the floor of the van. They’d stopped once, very early on, before she’d had time to get over the shock or formulate any plan of escape; by that time the man in the back with her had already tied her up. He got out, leaving her alone, and the van door shut – and they were moving again. The noise of the engine was unbearably loud; the van would bump and jolt as it went over potholes. Her head ached as a result, sometimes so badly it made her cry. The fear made her cry. Crying made her headache worse, and then it all became pointless, so she would stop for a while and try to sleep in snatches, because sleeping, at least, gave her a brief respite. And she would dream of him, remember, and wake with tears on her cheeks, thinking, This wasn’t supposed to happen. Then the shock and the fear would kick in, and the whole cycle would begin again. Elizabeth Haynes worked for many years as a police analyst. Her first novel, Into the Darkest Corner, won Amazon’s Book of the Year in 2011 and Amazon’s Rising Star Award for debut novels. Elizabeth grew up in Sussex and studied English, German and Art History at Leicester University. She is currently taking a career break having worked for the past seven years as a police intelligence analyst. Elizabeth now lives in Norfolk with her husband and son. She is a regular participant in, and a Municipal Liaison for, National Novel Writing Month – an annual challenge to write 50,000 words in the month of November. 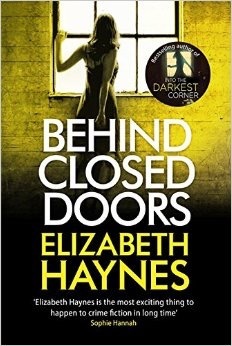 Behind Closed Doors is Elizabeth Haynes’s fifth book and the second to feature Detective Inspector Louisa Smith of the Briarstone Major Crimes. Behind Closed Doors deals with the difficult subject of human trafficking, although a disturbing subject Haynes manages to deal with a difficult subject in a sensitive way. I was engrossed reading about Scarlett and what happened to her, but I found the present-day investigation into organised crime rather hard to follow. This entry was posted in Elizabeth Haynes and tagged Book Blog Tours, Book review, Crime, Crime Thriller, Mystery on February 1, 2016 by lollyrugs. Ten years ago, fourteen-year-old Scarlett Rainsford vanished without a trace during a family holiday to Greece. Not being able to find Scarlett was one of the biggest regrets of DCI Louisa Smith’s career and when Scarlett is discovered back in her home town after all this time, Lou is determined to find out what happened to her and why she remained hidden for so long. Was she abducted or did she run away? As Lou and her team delve deeper into Scarlett’s past, their investigation throws up more questions than it answers. But as they edge closer to the truth about what really went on behind closed doors, it is more sinister and disturbing than they had ever imagined. Behind Closed Doors is Elizabeth Haynes’s fifth book and the second to feature Detective Inspector Louisa Smith of the Briarstone Major Crimes. Behind Closed Doors deals with the difficult subject of human trafficking, although a disturbing subject Haynes manages to deal with a difficult subject in a sensitive way. I was engrossed reading about Scarlett and what happened to her, but I found the present-day investigation into organised crime rather hard to follow This is a book that will thrill lovers of the police procedural sections which gave an air of authenticity to the story, but at times I felt they we’re unnecessary, especially the witness statements, which were almost impossible to see on my kindle. Although I enjoyed this book, it’s not Elizabeth Haynes at her best, and I have dropped a star because in parts I found it hard to follow. This entry was posted in Elizabeth Haynes and tagged Crime Thriller on September 28, 2015 by lollyrugs.